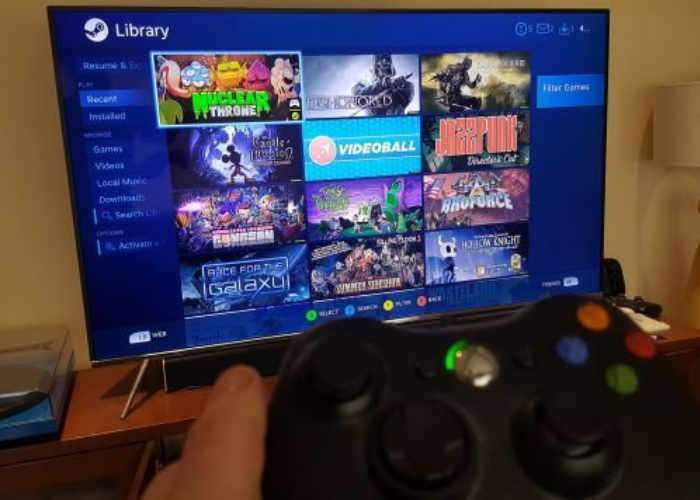 Gamers that own Samsung TVs created in 2016 or 2017 now have the ability to download a new Steam Link application which has been created by Valve and Samsung to enable you to play Steam games directly from your account on your large screen TV. The newApplication works the same as the Steam Link hardware box, but you no longer need to buy the hardware to enjoy your Steam games on your large screen Samsung TV. Samsung is adding Steam Link functionality directly to their latest line of Smart TVs. If you are in the United States and have a 2016 or 2017 Samsung UHD TV, we’d like to invite you to help test the Steam Link App, now available as a free beta from the Samsung Smart Hub. The App uses the same streaming technology as Valve’s Steam Link, allowing users to play their favorite games, and even spectate VR games on the HTC Vive, wherever they watch TV. During the beta, playback of 1080p video at 60 FPS and support for the Steam Controller are included. For worldwide release later this summer, support for streaming 4K resolutions and additional controllers will be added. Note: Streaming to the TV requires a Steam Controller and a high-quality network, at least 5GHz. A wired network is strongly recommended. For more information on the new Samsung Steam App jump over to the official Steam website for details by following the link below.